Most people who are preparing for a future economic collapse or SHTF event realize that life as it is today could be radically altered. One of the main things that will change radically if the world experiences another severe economic collapse due to an EMP event or another extended grid-down situation will be diet and cooking methods. 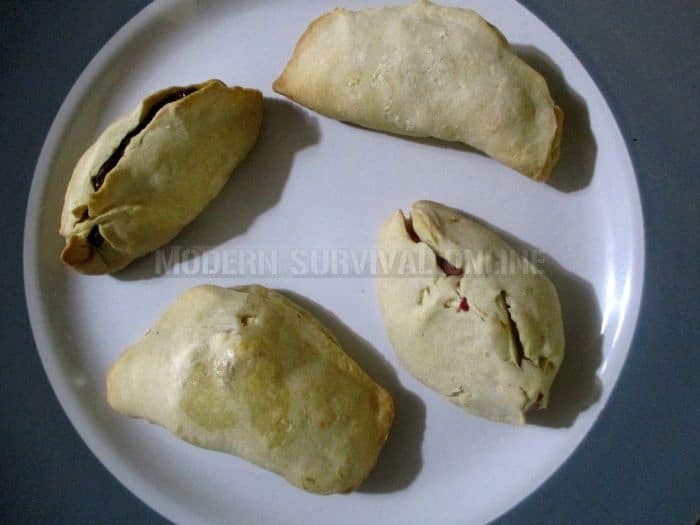 Many preppers are looking to the tried and true recipes of the Great Depression period which began in August 1929 and lingered through approximately 1941 in the United States and Europe. It was the worst recession of the Western industrialized world. It truly altered the way of life for many families. Vegetable gardens were nurtured, clothing was patched and repaired for longer wear, and several generations of families often lived together out of necessity. Shopping in the Depression Era was much different than it is today, especially for lower income and middle class families. Following an EMP or other SHTF event, shipping, trucking, and commercial food manufacturing will again be at a standstill. We may once again have to shop like our ancestors did during the Depression Era. Preppers will need to buy now and properly store large quantities of things such as beans, rice, flour, sugar, cornmeal, potatoes, and sea salt. Growing your own herbs for seasoning and vegetables to eat will be crucial. Eggs will soon be at a premium, or only available through bartering, if at all. The same will be true for raw milk, cream, butter as well as bacon or pork, and beef. You will need to raise your own chickens, dairy cow, pigs, and beef cows or trade something valuable that you have plenty of to get what you want from someone who does have it. For those who raise or grow their own food, it will be important to learn how to build a root cellar to extend the life of your harvest for leaner times that may come. Without electricity, storing of dairy and other perishable items will need to be done in something like a zeer pot “fridge” in hot weather. • Flexible. You can omit or substitute many ingredients and you will still get good results. This is also idea food for the starving student, young single parents, or others of limited economic means. This will provide nourishment, allow you to develop and practice basic cooking and baking skills, and keep you from wasting money on microwavable prepared foods, which are often expensive and heavily laden with salt, high fructose corn syrup, or saturated fat. You do not need to spend a lot of money or prepare elaborate and pretentious dishes to eat well. This not Haute Cuisine; these recipes are for rough, crude simple dishes designed for sustenance. They will not be that appealing to the eye. I have also included some recipes that meet the Depression era criteria for simple food, though they are not from the actual Depression era. With these items, you will be able to produce a wide variety of low cost meals. Breakfasts during the Great Depression Era varied widely according to socio-economic status of the household and what was available at the time. It usually included some kind of dried or baked fruit if fruit was plentiful for the family, a creamy grits cereal or farina cereal, some type of bread and tea or coffee. Milk and eggs were expensive, so unless the family raised their own cow or chickens, many meals didn’t include them during the Great Depression. 6 slices whole grain bread. Place a skillet over medium heat. Melt butter in the skillet. Add the bread, and brown it on both sides. Lower the heat, pour in milk, and let the bread absorb it. Remove bread from the pan when the milk is warm. Add salt and pepper to serve. Eggs can also be added to the skillet to poach in the milk. This can also be made with a little condensed milk and a dash of brandy for a sweet, dessert like dish. Mix ingredients and enjoy. You can also add raisins, or diced dried or fresh apples. This can be made sweet with honey, sugar, maple syrup, or molasses, or savory with salt and pepper or beef broth. Bring water to a boil. Slowly sprinkle in cornmeal, constantly stirring so it does not get lumpy. This can be eaten as is with butter, salt and pepper. You can also add milk, cream, leave out the pepper and sweeten with brown sugar, honey or maple syrup. It can also be poured into a loaf pan and kept in the refrigerator overnight until it thickens. Slice and fry in butter. Pour milk over cornmeal to serve. Mix cornmeal with bone broth or water and allow to sit overnight. Form into loaf pan. Keep in refrigerator. Slice and fry in bacon grease. You could also mix ½ cornmeal and ½ boiling water, let cool and form into a patty and then fry in grease (no overnight soak required). Pour milk over cornmeal. 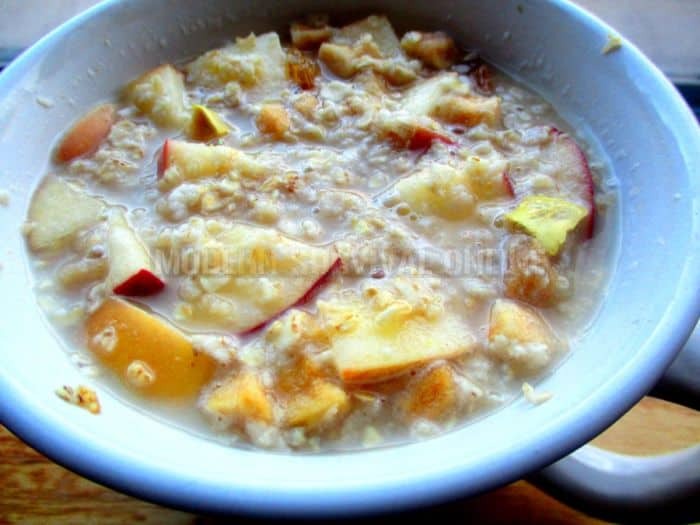 At its simplest, oats boiled in water, served with cold milk or cream, salt and butter. There are different British, Irish, and Scottish versions. I have included diced apples and golden raisins here. People in Tibet drink a strong, smoky tea with pink Himalayan salt and yak cream. It is a warming and inexpensive source of calories, it replaces salt that has been sweated out, and the caffeine provides a boost. There is a trend of serving buttered coffee that is adopted from this. It is supposed to slow the absorption of caffeine so you are not wired, and give you slow burn energy. There many claims about the benefits of buttered coffee that are farfetched. You could probably get the same results from black coffee and butted toast, but this is something different to try. Here are some contemporary versions. These are not depression era per se, but are so simple, inexpensive, and … I am not sure if you could say nutritious… they deserve a mention here. 12 oz. of brewed hot Coffee or black tea, or hot cocoa. This is also interesting made with Rooibos red bush tea. Stir all together and drink up. • Any fruit you have available. Spread butter and jam on bread. Add fruit. Drizzle with maple syrup. Sprinkle with spirits. .Top off with another slice of buttered bread. Slice and enjoy with black coffee or cold milk to offset the sweetness. Mix above ingredients and eat well. Cook on hot griddle. Combine all dry ingredients first, and then pour in milk and well beaten eggs. Add butter to cast iron pan to grease pan. Once pan is hot, pour in the mixture. Cook in hot oven for twenty minutes. Serves six. Sift flour, cornmeal, salt, and baking powder, twice. Take cold butter and use a knife to integrate it into the mixture finish by rubbing it in with your hands. Quickly mix using cold liquid (milk or water) and form into soft dough. Lightly flour a wooden board and roll dough into a ½ inch thick sheet. Use a tin can to cut dough into round pieces. Sprinkle a shallow pan with flour and place rounds slightly apart from each other. Bake 10-15 minutes until golden. Using a large mixing bowl, pour in flour and create a well in the center. Add yeast and dissolve with warm water. Mix together and form a ball. Use towel to cover. Let rise to double its size (30 minutes). Punch dough down and cut into two pieces and roll each piece into a loaf. Let rise a second time until it reaches top of pan. Uncover bread, slit tops, and bake in oven on 300 degrees. 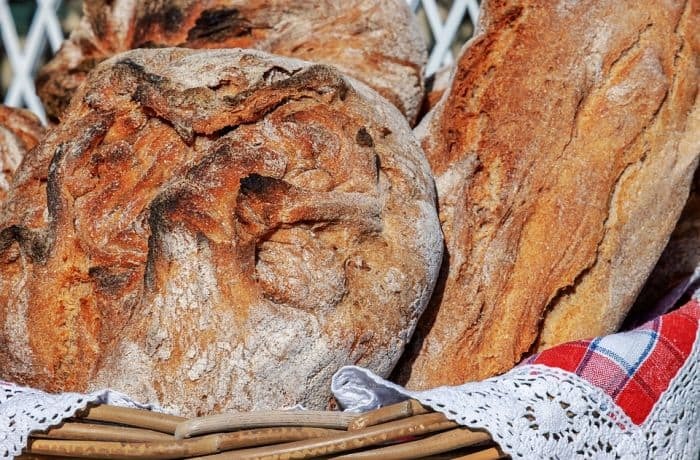 Rub hot bread with water and wrap in a lightweight towel to make crust softer. This is a long shelf-life plain, hard big cracker. When it is baked, it should be dry and hard. Serve it with butter, jam, or honey. It is also traditionally dipped in coffee, tea, or soup to soften it and make it easier to eat. Pour water into a mixing bowl and gradually add the flour. Stir continually. Stop adding flour when it becomes too thick to continue stirring. Knead and fold dough. Roll to a ¼ thick sheet. Wet your hands with water, and lay the dough on an oiled baking sheet. 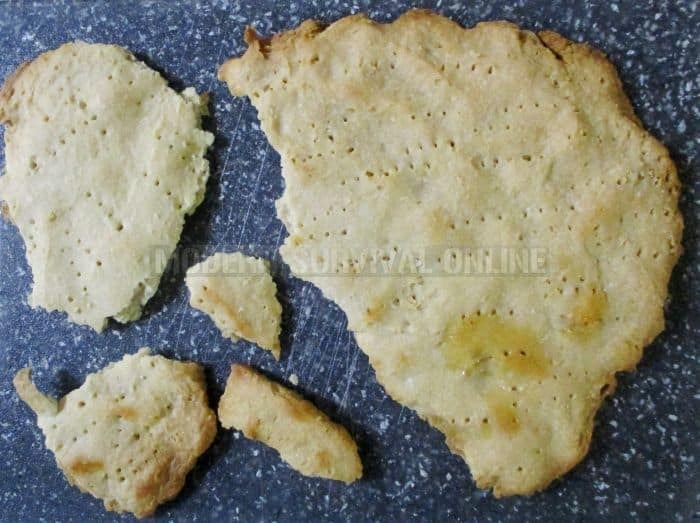 Use a toothpick or fork to poke holes in the dough. Bake at 375 degrees for about 20 minutes, checking it frequently to make sure it is not burning. You may need to flip it over and bake for more time. This is the most basic form of bread. You can add a slice of fresh or dried fruit, berries, or a piece of meat to come up with some interesting varieties. I prefer raisins and apples. As the ashcakes bake, moisture from the fruit will keep the cakes moist. These are good served warm with butter melted over them. • Place directly on a bed of hot coals, or an oven set to 400 degrees in aluminum foil and bake until browned. Brush off ashes if needed, and serve with butter. Mix milk, potatoes, salt, pepper and eggs, together. Blend in flour, and if available/desired, bacon and cheese. Continue blending until smooth.. Drop onto oiled hot griddle, flip as needed. • Add bacon, sliced hotdogs or sausage, or ham steak if desired. Sear onions in an oiled skillet. If using meat, sear the meat as well. Pour beans and drippings from the skillet into a large pot and cook slowly over low heat with onion and pork. Add water as needed. • ½ cup carrots, turnips, or parsnips. You can just throw everything into boiling water, but for best results, meaning the most flavor, sear the veggies first. Sautee them in the butter or oil. Add the tomato whatever, water and simmer. The salt and pepper should be added just before serving. The title of this recipe says it all. It does not get any simpler. Sear the meat in a skillet. Stir in the onions , potatoes, and other root vegetables, and sauté until browned. Dump the contents including drippings for the skillet into a quart of water. Add oatmeal, and simmer over medium heat until the oats are cooked though. If you are using meat and onions, sear them in oil in a heavy bottomed stockpot. Add water and bring it to a boil. Add the peas or lentils and carrots. They will take about 45 minutes to cook. Add more water as needed. 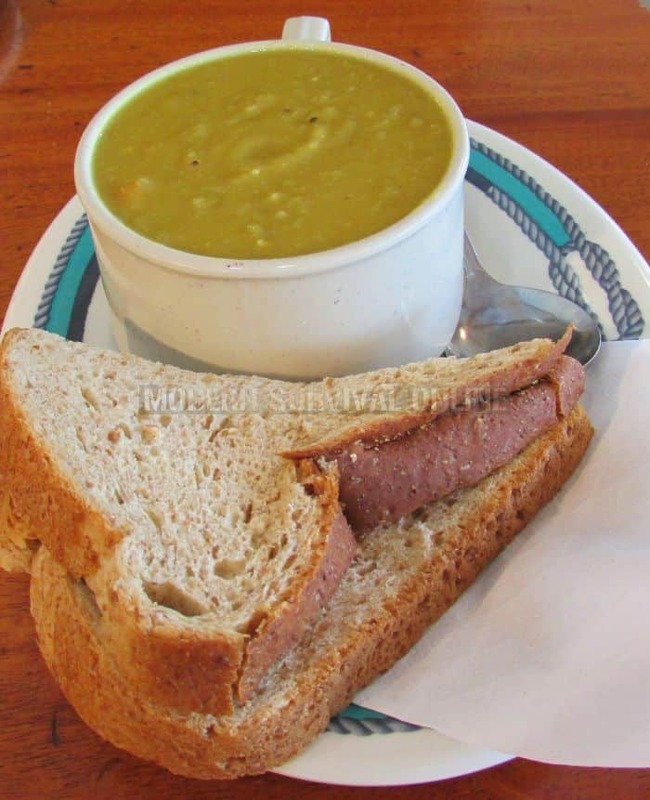 If the only main ingredients you have are the split peas, you can still make Pease porridge. Add salt, pepper to boiling water, and simmer peas until tender. Add butter before serving. • Beef bones cut into roughly 6 inch sections. Sear the beef bones in an oiled skillet. Add them to a pot of boiling water, and put in one cup of vinegar. You can sear the veggies for better flavor, or just throw them in and let them simmer until tender. This can be strained and drank as broth, or used to make rice or pasta with more flavor and nutrients. It can also be eaten with the veggies included. Every time you prepare another dish, save the scraps of veggies and peels, and add them to the soup with more water and re-boil it. You can also save and freeze veggie scraps. When you get a full Ziploc bag, it is time to make soup. 1) The vinegar will help draw the calcium out of the bones, but you will not taste it by the time this is done. 2) Do not add beans, rice, grains, pasta, or soft veggies e.g., squash, eggplant, or peppers, Stick with root veggies or this will turn rancid quickly. If you want to add these ingredients cook them separately, then ladle the broth over them. 3) Re-boil every 48 to 72 hrs. to keep the soup fresh. This is not a precise recipe. It is a one-pot rough, crude, delicious, and filling meal. You can use whatever amounts of ingredients you have on hand. Begin by searing meat in an oiled skillet. Beef will give the best results, but you can use pork, lean poultry or wild game as well. Add whatever vegetables you have available and sear them until they’re browned. 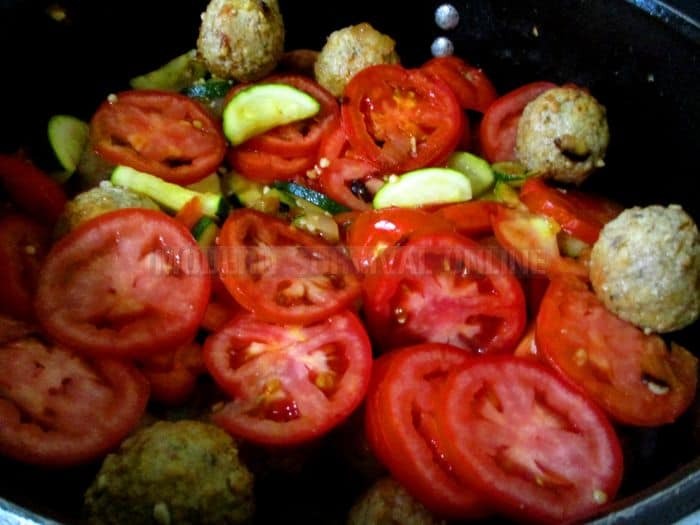 Thin the meat and veggie mix with a little water, and stir in mashed potatoes or instant potatoes. Simmer over low heat until warmed, and thickened. The consistency can be like thick oatmeal, or thinner like a soup; that is up to you. Glop can be so thick that it gels when it cools. You can slice it and fry it for a kind of meat/veggie/potato loaf. I personally like my glop thick. Add chili powder and curry powder just before serving. 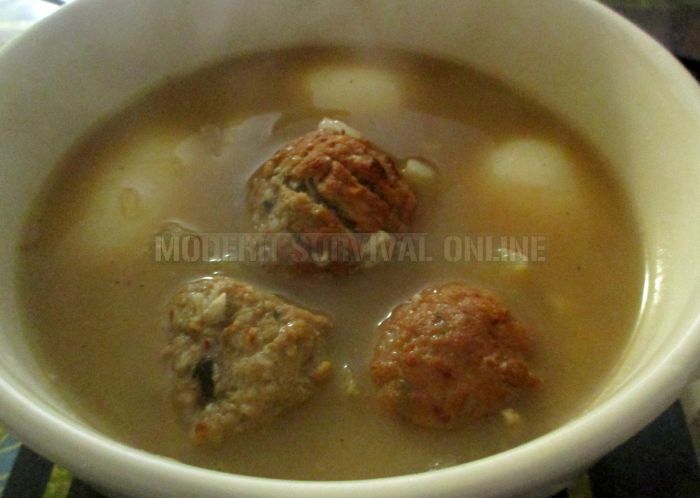 This recipe pre-dates the Depression era, but its frugal simplicity deserves a place here. This was a frontier meal that made use of whatever was left over from livestock slaughter, and/or cleaning wild game. The authentic versions were all organ meats, included the marrow gut tube of a calf. If rum where available, that would be added, as well as hot peppers, black pepper, and salt. This is an upgraded version, in which you use whatever meat you have on hand. Throw in organ meats as well, which are an all too often overlooked and inexpensive source of protein and nutrients. Liver is loaded with vitamin A and iron. Sliced sausage, hotdogs, or bratwurst. A handful of smoked dried peppers such as Ancho or chipotle, or one 5- 6 oz. bottle of tabasco or other Louisiana style hot sauce . Yes, the whole bottle. Cut all of the meat into bite sized pieces. Sear it in an oiled pan. Cover in water, add rum, and boil until the meat is cooked through and tender. Add the hot peppers, onions and garlic if available and salt and pepper. Lower the heat, and simmer for a few more minutes. Serve as is, or over rice or potatoes, and with buttered biscuits, hardtack, or bread. Hoosh was a staple meal of Antarctic explorers. Again, this recipe predated the depression by about ten years, but it deserves a place here, as it makes the most of what you have. This is a modernized and more hopefully more palatable version. Water, or for authenticity, fresh clean snow. Boil the water, and add the meat. Simmer, and add broken up crackers, butter, and seasonings before serving. You can also make this with bacon and/or beef jerky. This is not complicated. 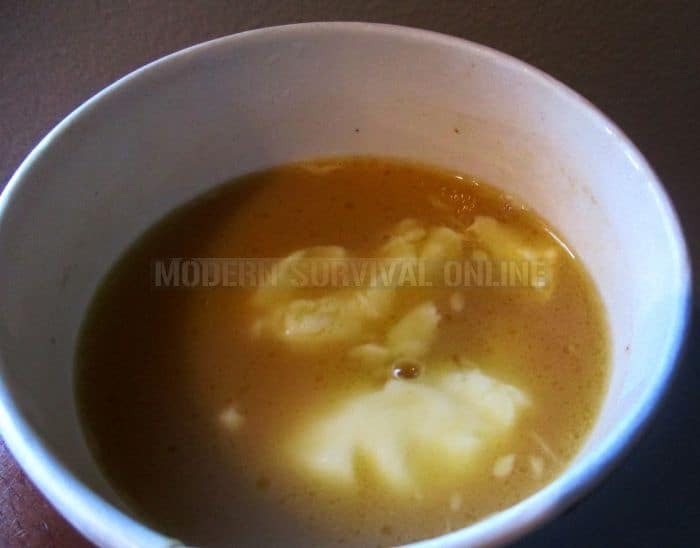 Boil water, stir in butter and milk and mashed potatoes. Add seared meat if desired, and toss in some potato chips to serve. 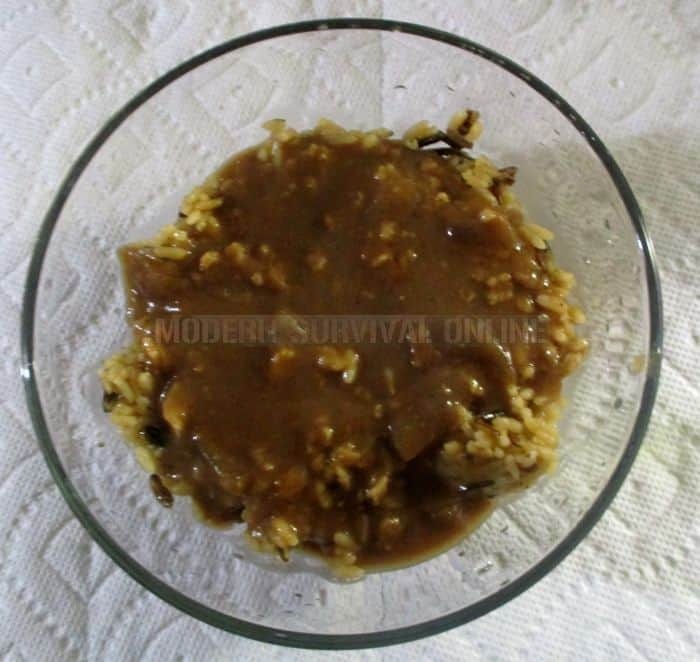 This was a simple meal served to the US military during World War II in Hawaii, post-Depression: An ice crème scoop of white rice, with a ladle of gravy over it. According to a WWII vet, this was all they were served some days when food was scarce. A modern version is loco moco, which adds a hamburger on a bed of rice, covered with gravy and an egg on top. Here is a little more nutritious but still simple version. Small onion chopped and seared in oil. Heat the gravy, and stir in onions and mushrooms. Pour over cooked rice, and add salt and pepper. Top off with a fried or poached egg. (Optional). Sear sweet potato slices. Cover with water and bring to a boil. Mash the potatoes in the water when they are soft. Stir in butter and maple syrup. If using pumpkin, you will need more maple syrup to offset the bitterness. Serve with milk or half-and-half. You can also add sliced apples. Put them in after the potatoes so they will soften. My favorite version of this is with acorn squash. I grew up with this Italian peasant food. Italians had a reputation for eating well during the depression. This I one of the dishes brought to the US by Italian immigrants, who knew how to make the most of what vegetables were readily available, and often grown in home gardens. It was a thick vegetable stew as I remember it, typically served with soft Italian bread still warm out of the oven. Throw in sliced sausage or meatballs if desired. • Sliced or diced tomatoes, preferably Roma tomatoes. Sear the veggies in olive oil. Add wine or vinegar to pot and simmer until veggies are tender. Serve with a drizzle of olive oil, and a sprinkle of parmesan. 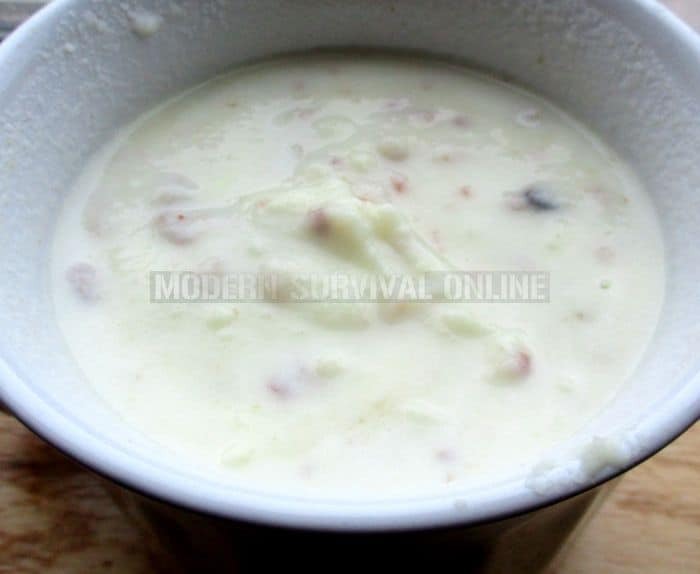 This can also be ladled over crusty stale bread, and topped with parmesan to make aqua cotta, or bread soup. Insert lemon slices and pats of butter into the cleaned fish. Sprinkle salt and pepper and grill over hot coals or in an oiled frying pan. Turn as needed until flesh is firm. You can use crappies or perch for best results, though trout or walleye are also very good this way. Dice meat in small sections. Soak half of it in water for 60 minutes. Heat water and meat to boiling gradually. Salt and pepper remaining meat to season. Dip in flour and brown with onion in about 3 tablespoons of fat. Combine mixture with meat. Continue to cook, about 60 minutes, until tender. Add vegetables and ½ cup cold water. Cook until veggies are tender. This is a great, easy one-pot meal. 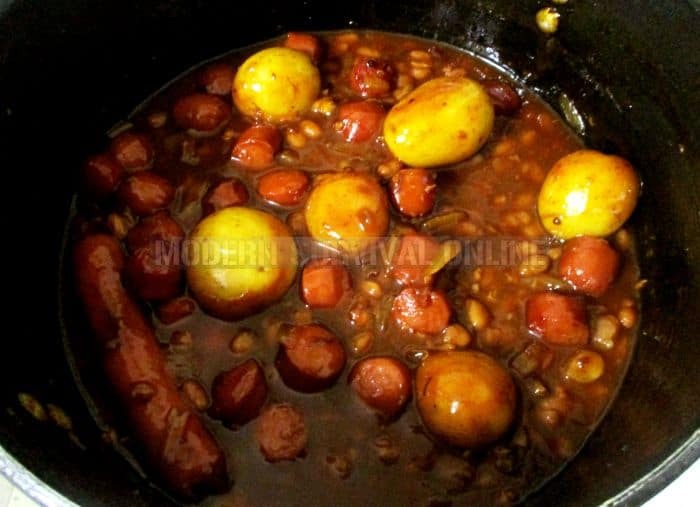 Slice some of the hotdogs; keep others whole for traditional serving on rolls with mustard. You can also throw in a can of beans. Add about 1-3 tbsps. vegetable oil to a pre-heated skillet. Put whole, unpeeled potatoes into a skillet and add sliced onions. Let potato and onion cook and slice hot dogs (or leave them whole). Add ketchup and brown sugar, followed by hot dogs. 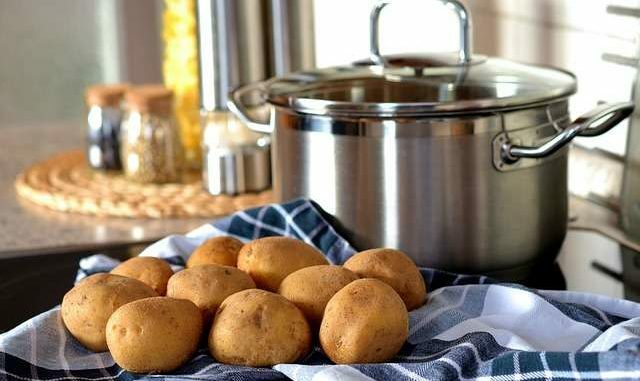 Add ½-cup water; continue cooking until potatoes are soft. I also like to add Louisiana hot sauce. 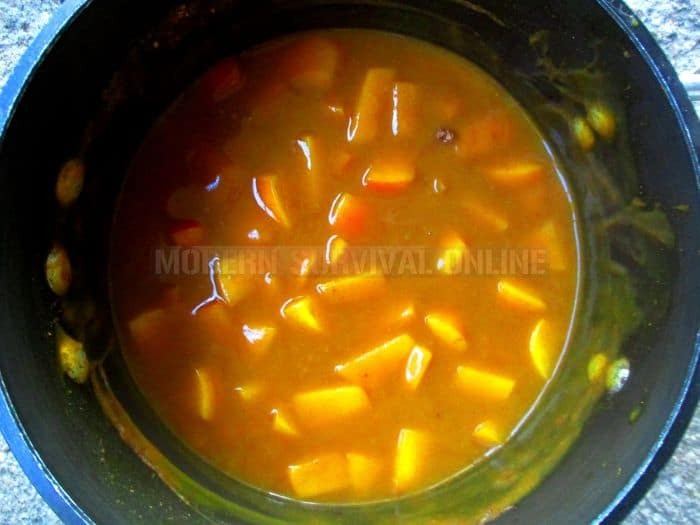 This can be eaten as is with buttered bread, or served over rice or noodles. Dump in a can of beans as well. Sift salt together with flour and baking powder. Then cut with fat. Slowly add milk or water to create a soft dough. Roll out and put on the pre-greased pan. Drop directly into stew or soup, cover, and cook 30 minutes. It was not uncommon in the Depression Era for families to make a meal out of whatever types of vegetables were in season or available that day. Cut vegetables into large pieces, add butter and salt and pepper to taste. Wrap in tin foil, and cook in the oven or even in the coals of an open fire. This cake (bread?) basically makes use of whatever you have on hand. I remember eating this one morning when I was a broke college student. I looked around to see what I had in the cupboard, put it all together and baked it. It was not bad, and with black coffee, (I used up the last of the half-and-half in the cake) it fueled me so I could go to work and earn more money. Pre-heat oven to 350 degrees. Mix dry ingredients in a mixing bowl, and stir in wet ingredients. Add fruit. Pour into oiled cast iron skillet or baking dish, and bake until a toothpick inserted in the middle comes out clean. Beat eggs and sugar and then mix in the flour. 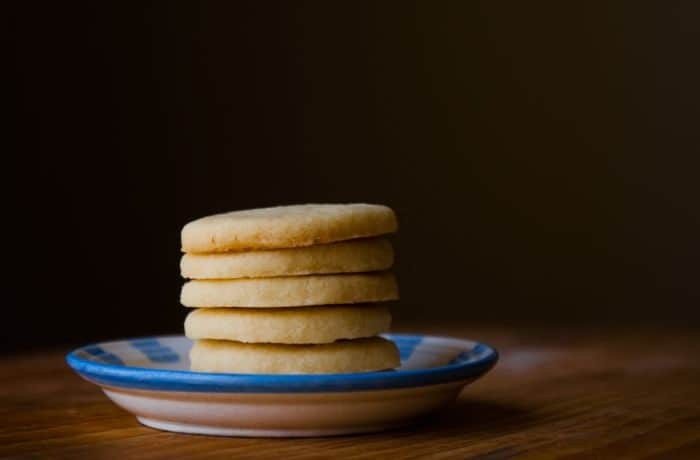 Roll out cookie dough on a floured surface. Use a glass to punch out rounds of dough. Place on an oiled cookie sheet. Bake in a pre-heated oven at about 300 degrees until golden. Raisins, or chopped dates, prunes or dried apricots. Fill pan with ¼ inch of water (or cider) to prevent burning. Core apples and fill with chopped dried fruit. Bake 30 minutes at 350 degrees or until tender. This is the dessert version of the aforementioned Antarctic explorer staple. Precise measures are not necessary, and as long as you have water, crackers, and cocoa, it will come out reasonably edible. Water or a handful of clean, fresh snow if you really want an authentic version. Boil the water, and stir in the cocoa, sugar, and raisins. Lower the heat, add the whiskey and simmer. Add broken up biscuits and butter before serving. You can also add some instant coffee, condensed milk, or marshmallows. Eat outside when it is below zero. Today we are lucky enough to have some modern conveniences available to us that make securing food and cooking meals much easier than they were in the Depression Era. Most preppers have come to the realization however that following an EMP or SHTF event that would create an extended grid down situation, we may very well have to revert to some of the methods used by our ancestors to feed their families. If you have already started storing bulk dry goods, growing your own vegetables, and raising your own livestock when such an event occurs, you will be miles ahead of many people. Tuck these recipes away or even try some of them this week so that you can be confident in your ability to cook in a way that will sustain your family and boost morale during tough times. What’s your favorite Depression Era recipe? Share with us in the comments below. Reading all these recipes is very sobering. I think it’s a good idea to have plenty of dried herbs on hand to enliven whatever vegetables and meat one does manage to have on hand. Thanks for publishing these. Don’t forget that hobo special, rock soup. Around my mountain top, fast food is rabbit and squirrel. Great recipes for the limited larder. Milk toast anyone? Have ALWAYS appreciated learning from those who have gone before and experienced how it is done. Storing what you eat will take you a long way but eventually adapting and adjusting to what is available is key to living. Cooking is NOT rocket science, but it IS science…..knowing why/how food and the added ingredients behave/interact makes for a shorter learning curve and more enjoyable results. Most of these recipes are great for using up left overs. We used to eat a lot of these growing up. Mom never left anything to go to waste. If we had left over rice, she added hot milk, a little sugar and raisins to make a rice pudding. 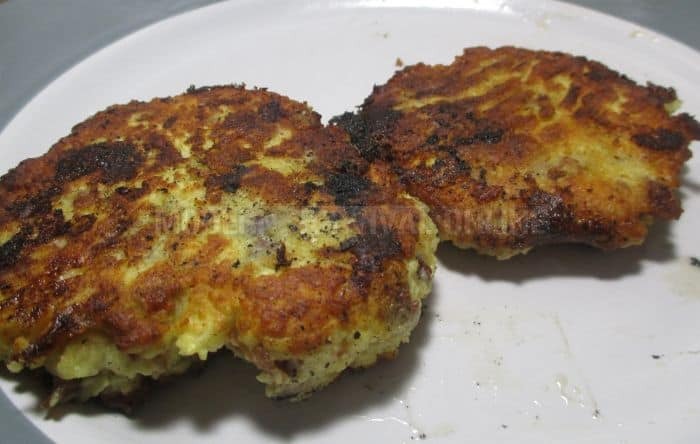 Mashed potatoes were either made into cakes and fried for breakfast or mixed with some fish to make fish cakes. If we had had left over chicken or hamburgers, they were used for breakfast the next morning. She was born in 1911 and her mother died when she was 9 from the flu epidemic. She had to quit school and take care of the family and learned the hard way that nothing went to waste. I don’t care what us boys killed when we were hunting, fishing or trapping, she had a recipe for it and we ate it. Some of these recipes brought back pretty fond memories. I didn’t realize until just now that this is still how my husband and I eat, pretty much every day! And we are in our 50’s and 60’s. I always thought we were just kind of weird. We don’t shop anymore because we have to, but because we want to. We’ve been growing, storing and preserving our own food, foraging, fishing and hunting, and bartering for a very long time. Of course, if everything did go South, we would most likely suffer a great deal, just like everyone else, but from lack of AC, having to scrounge water, etc. Thank you for shareing. Number 25 has been passed down in my family as the “Eggless, Milkless Butterless Cake”. It was offter used in the winters when the chickens stopped laying and the cows dried up getting ‘ready to calf’. I am with Karen. We ate like that all the time. I have been cooking most of these my whole adult life. Except cornbread in milk. We crumble up leftover cornbread and pour milk over it. We never cooked it just to eat with milk. We ate it fresh from oven with beans. Always! Leftover beans go into vegetable soup. Hotdogs were a special occasion food. 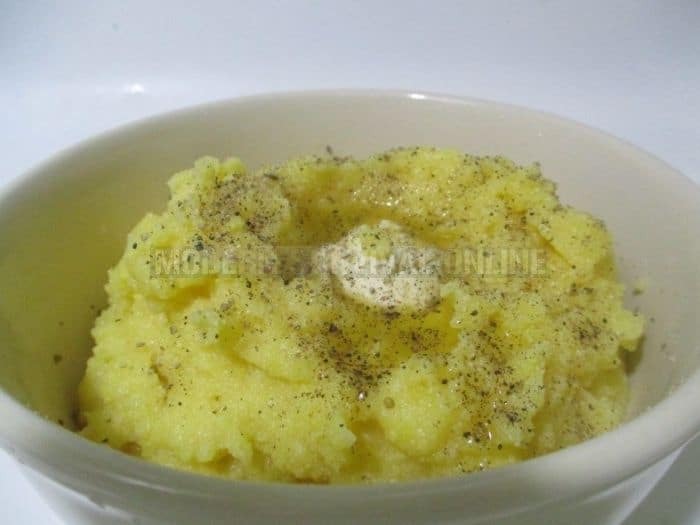 Potatoes and onions were a side dish for beans or eggs. Leftovers go to work for lunch or are eaten for lunch at home. 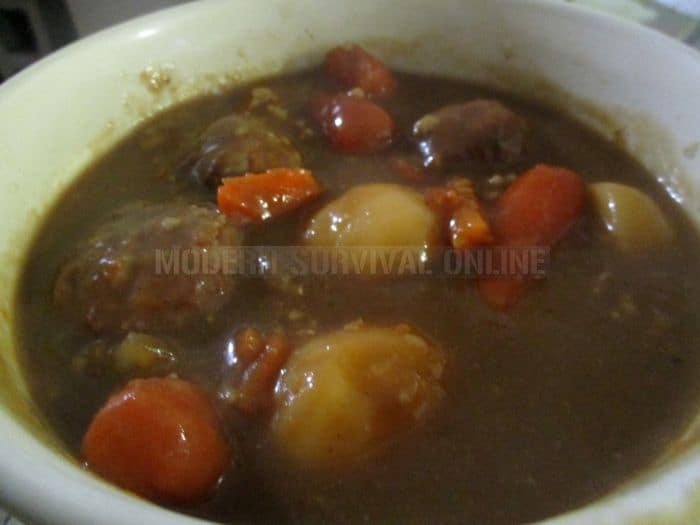 Lets not forget leftover stew. I still have this at times. Take whatever is left over in the fridge,rice,beans,potatoes,meat veggies ect and through them all in the crock pot. Cook on high for about 636 hours and serve with sourdough bread or biscuits. Don’t waste money and cleans the fridge. I tried sending it to you but it seems the email you used to write this comment is invalid. Could you please add another reply with the right email? Thanks. We used toeat all these recipe when we were young. On the Fresh Bread, don’t forget to add 2TBSP of salt to help bring out flavor. Baking powder biscuits with sausage gravy or milk gravy are still a staple for a quick, filling, cheap meal. Other dishes some may still remember are no-nothing cake and vinegar pie. Check thru vintage cookbooks for more ideas. Also Amazon has old cookbooks you can download free to Kindle. Practice now so you’re ready later.